Usually seeking sunshine, we embraced the idea of a city break in winter. 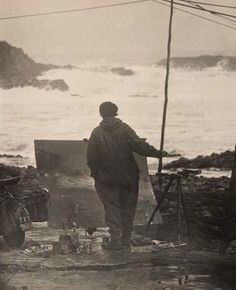 Longing to see the Joan Eardley exhibition and after hearing good things we booked a four day break in Edinburgh on a fact finding visit to include all the galleries and art centres. Edinburgh is an imposing city built over seven hills with a long city centre down the middle. We were incredibly lucky with the weather; sunny crisp days with no wind and white frosty mornings. The dark grey buildings glistened aided by the Christmas lights strewn across streets and buildings. There is a ‘wow’ moment around every corner. Whether a large row of Georgian mansions in a crescent, a small park, a beautiful hotel, a cobbled street, a narrow row of terraced cottages, the steep steps linking lower and upper levels or the ‘closes’ , what we call ‘drangways’ in Cornwall these little covered paths lead to a courtyard or the back of a building. History has left its mark and nothing prepares you for the view of Edinburgh castle and Holyrood perched on the steepest of hilltops. The walk along Princes street, and onto the cobbled lanes that lead up steeply to the castle is magnificent and gives you views right over the city as buildings rise higher and higher. We were in the old town and found lovely shops and pubs in the grass market area where we also stumbled across greyfriars church with its ancient tombstones . The elephant cafe was a must where J.K Rowling wrote the Harry Potter series . The new town on the other side is also stunning with the back streets full of gorgeous cafes and pubs. Recommended areas are the West End, Stockbridge, Rose Street and Thistle Street which lie on the back roads of the main New Town. The old town has it’s charm but also feels more touristy. Not city people, we are always looking for a bit of sanctuary and found this on the Water of Leith, a six mile walk that can be joined at several points along the river. We had been to the modern art galleries and could join it at the bottom of the garden and walk to Dean village and on to Stockbridge where we found a great Scandinavian bakery ,St Peters Yard . From here it was a fifteen minute walk uphill back into the main town. By day three we were seriously flagging so jumped on a tour bus to see the outer reaches through Leith and by the royal yacht Britannia. Travel is easy with great buses and the tram system. And from the airport there are dedicated buses that run every 10minutes . Our flight from Exeter was just an hour and on our return having left Edinburgh airport at 11am we were at home with a cup of tea by 1.30 pm. The ease of our trip means we will be going back. There is still so much to see. Just before Xmas, I managed a pitstop night over to visit Sarah, an old friend who wasn’t in Bude for long, but in that time we made a great connection. Now living in Bath when I asked her if she would make one of her seaweed lampshades for me, she said yes but only if I came to visit and collect it in person. It was a perfect time to visit and finish some christmas shopping whilst taking in a bit of Bath. We slotted back together immediately; we have a similar eye for things, but unlike me, I’m quietly jealous of her ability to be unaware of time and the general semi organised untidiness which she lives in. A dolls house strapped to the wall has her mugs in it , old seventies corner cabinets are laiden with her collected treasures, the squashy collapsing chairs and sofas are soften by velvet covers and ticking . Nothing matches but all lives happily together in a mutual tone of cosiness and warmth with the two cats, Moth and Watermill. IT IS Sarah’s ‘Hygge’. After a whistle stop tour of Baths finest architectural landmarks, we did a spot of shopping, drank the sulphurous waters of Bath from the Kings fountain in the pump room (a little know secret); and picked up some cheeses, salmon and the makings for mulled wine . She is the queen of make do and mend, shunning consumerism in favour of making everything her own with a twist of creativity and a love of nature. Whilst the mulled wine was brewing we revamped her chandelier. Spraying it grey in a confined space with candles burning on reflection wasn’t a good idea, but hey.. we survived it. We didn’t quite get to completing it with the strings of collected broken shells but it will look fabulous when done. The conversation never stopped, from kids to men to life, friends and lots of inspired creativity home ideas . We even made a velvet stole for me to take back. It’s beautiful and totally unique ; just like the darling Sarah. This is titled ‘I’ve got a loose connection with my bulb’ as it summed us up perfectly over the 24 hours, but was really reference to a temperamental sewing machine while piecing velvet and silk together. Just like me and Sarah. I like the idea that fate plays a part in our lives and Joan Eardley was calling me. 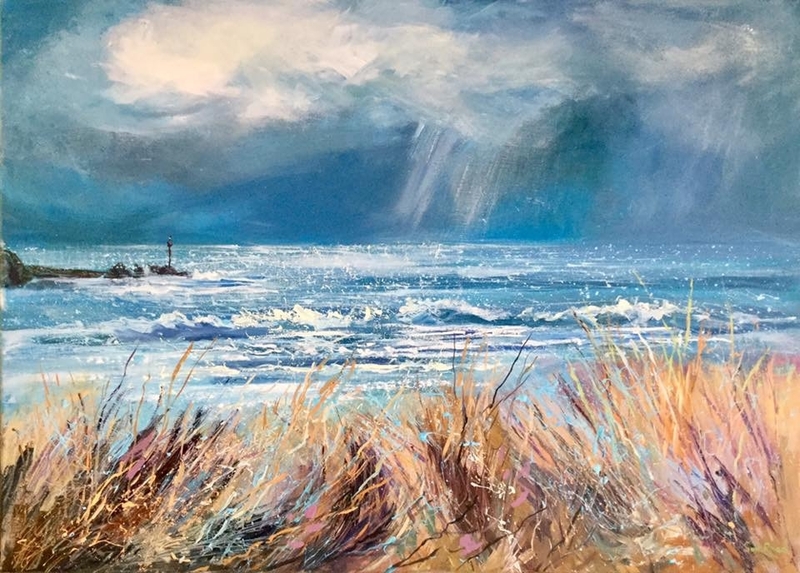 We have a beach hut for the winter at Crooklets and I have an idea to paint the sea in all weathers using the beach hut as my base and also sanctuary for tea and soup. 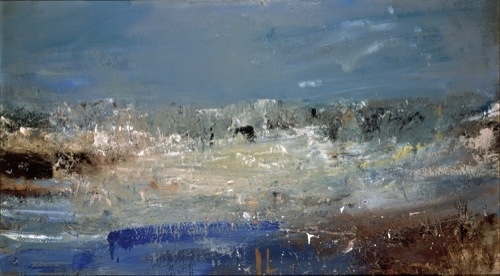 My heroine has long been Joan Eardley, a painter of semi abstract expressive seascapes on a massive scale. She painted outside in all weathers and ever since I saw a painting at the ‘Power of the Sea’ exhibition at the Royal West of England Academy in Bristol, I have been waiting for a new show of her work. So you can imagine as a fatalist this was an opportunity I couldn’t miss. This new exhibition was full of previously unseen works from private collections. This included one not seen in England since it was painted which came from the British Embassy in Tokyo, as well as intimate family letters with photographs and press releases. It all came together to give a real insight into the life she led. Rather than write a biography of this amazing lady I wanted to write about my experience. There are a few links at the bottom of the page which outline her work during her short life. She died at the age of 42 from breast cancer, but can’t help wonder what she might have gone on to produce and leave as her legacy. As it is, there are several hundred paintings from her home at Catterline of the village and sea, but also from her days in Glasgow where she painted the children in the streets and slums inviting them into her studio to sit for her. They are all stunning, very different in subject and composition, but alive with the same colour. Explaining the two contrasting subjects and her time spent in Catterline on the coast, she said ‘These kind of goings away are entirely necessary for me. If you paint, you need a rest but not the kind of rest an ordinary person thinks of, a holiday ‘. She divided her time between Glasgow and Catterline and could approach each subject with a fresh eye. Her passion to paint was so strong, it was part of her everyday life. We flew to Edinburgh during a cold snap in early December. From the guesthouse we walked just 1/2 a mile to the Galleries of Modern Art just outside the city centre. It was a fabulous crisp sunny morning but the frost was so strong and deep it felt like snow (not something we are used to in Cornwall). Along leafy streets, down a wooded slope we joined the Water of Leith. Crossing a bridge in this deep valley we ascended the other side to come out into the grounds of the galleries. It was an amazing start to the day. After visiting gallery One with a great selection of modern art from Bridget Riley to Warhol, with a mix of the French Impressionists and Scottish Colourists, we made out way across to the Dean Gallery for the main exhibition of Joan Eardley’s work titled ‘A Sense of Place’ in another beautiful building. Laid out over two floors in five galleries every turn gave you another view to a magnificent artwork. Thinking of it as a pilgrimage, the reality of being there, the excitement and a long felt connection; to see it all in reality with her use of colour and having a real feel of her being in the room, I welled up with tears more than once. From her drawings & sketches to her large works, there was a lovely journey of discovery of who Joan was and what her art meant to her. She used an enormous amount of paint and wasn’t afraid to be vigorous with it. Very few gentle strokes, but scrapes with thicker dry brush and softer rubbed areas just made your nerve endings tingle. The colours were confident and there was a strong blue she obviously loved that was jewel like and made other colours just sing. I felt a connection with this lady; she was confident, in her life and her art. She loved to paint on the beach in all weathers loading her motorbike with canvas and paints. The sea paintings on a massive scale are quite abstract and painted very quickly at each session. Many completed over several months with the oil thick in places and collage and sand mixed in. There was little white. A turquoise underpainting almost disappeared with greys, greens, siennas and blues all which way. They were totally mesmerising. People just stood and gazed. Why do we stand and gaze at artwork? It touches a part of our soul that nothing else reaches….that’s the only simple explanation I can come up with. I could go on and on and on. Her paintings so full of vigour, amazing colour, texture and vitality there is lots to say. 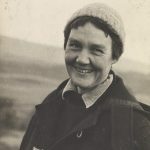 Choosing to wear men’s trousers ( her mother disapproved), repairing her cottage ceiling with old canvases, she loved her surroundings, she lived for her art; she died too young. The title of this post was nearly ‘I promised my son I wouldn’t get a motorbike’ . I have been so obsessed with Joan Eardley I think my family fear I might turn into her. My son’s comment to my facebook post about my pilgrimage to Edinburgh was ”Mum…. just don’t get a motorbike! ‘. I thought this article on the exhibition was the pick of the bunch. BBC Joan Eardley and more of her art here and for more about our trip to Edinburgh there will be a follow up post. I learnt to swim in Bude Sea Pool. An important part of Bude’s heritage it is unique in the country as they aren’t many open air pools, certainly not of this size. An art auction to raise funds was an inspired idea. Exposed to the Atlantic ocean and westerly weather, it takes a battering every year especially in the winter storms. The community took over it’s upkeep, preservation and making sure it is used with swim lessons, water polo and events some four years ago and in that time have raised thousands towards improving this amenity and landmark for the residents of Bude and it’s visitors. I have always supported ‘The friends of Bude Sea Pool‘ where I can and I swim in it for as long as the season allows me to depending on the temperature and weather. So when I was asked to donate something to the forthcoming auction, I decided to paint something specific. Titled ‘I want to stay forever’ I hoped it would appeal to the followers and people that keep links and membership to the pool but may live miles away from it. The auction had some sealed bids and with bids in the room on the night raised £450 for Bude Sea Pool funds to restructure and strengthen the last part of the sea wall. The total raised was over £5000.